Tournament will be held on Saturday, June 1, 2019. 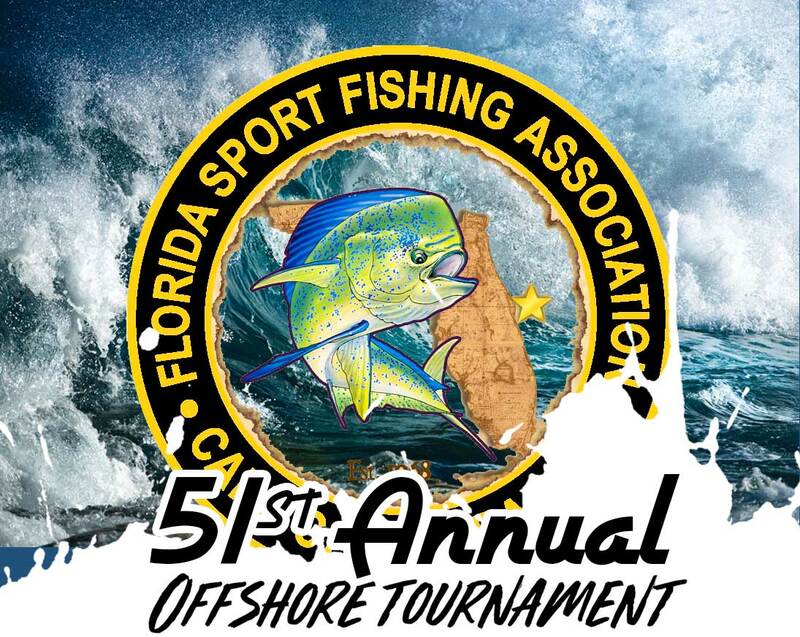 This is a one day tournament; in the event of unfishable weather, the tournament will be held on Sunday, June 2, 2019 or the following Saturday, June 8, 2019, then to be announced. The Captains’ meeting will be held at the Kiwanis Island Gymnasium on Merritt Island on Friday, May 31, 2019, doors open at 5:45PM. Tournament is open to ALL who enter. All Tournament Anglers will participate in this tournament at their own risk. All anglers are responsible for meeting Federal & State regulations on size minimums & bag limits on all species. All boats should comply with all state & federal regulations & should comply with all coast guard requirements and be equipped with a functional VHF radio. Weather call will be made at the Captains’ meeting based on the NOAA forecast of 6:00 PM. No refunds. All boat captains & anglers are responsible for their own safety and it’s the responsibility of the boat captain & crew to insure the boat is properly equipped and is operated within the limits of the boat and the skill and seamanship of its captain & crew. Each captain is responsible for making the determination as to whether the boat and crew can safely operate on the day of the tournament. The owner, captain and/or crew of each boat understand and agrees that neither FSFA, its officers, directors and tournament staff may be held liable or responsible in any way for any injury, death or other damages to the crew or the boat that may occur as a result of participation in this tournament or as the result of the negligence of any party including FSFA, its officers, directors and tournament staff whether passive or active. The owner, captain and/or crew intend to exempt and release FSFA, its officers, directors and tournament staff from all liability or responsibility whatsoever however caused including but not limited to the negligence of FSFA, its officers, directors and tournament staff, whether passive or active. $175.00 (including tax) payable in cash, check or Visa, MC, Discover credit cards accepted. Early Registration Package: ‘Early’ registrations will receive 2 Free $5 Raffle Tickets, 1 Tournament T-Shirt and 1 Raffle Ticket for ‘early registration special raffle.’ The first 100 teams registered receive a deluxe Captain bucket. Early Registration is defined as entry completed and paid on or before May 19, 2019. There will be no checkout boat or process on tournament day. Boats may leave from Port Canaveral, Ponce Inlet or Sebastian Inlet any hour on tournament day. There is no boundary limit for this tournament. However, no fishing lines in the water prior to 6:00AM. Cast netting of bait and sabiki is allowed. Nothing may be passed between boats after 6:00 AM. Boats doing so will be disqualified. Exceptions may be granted in assistance situations. Boats must return to Port Canaveral by water to weigh-in their catch. There will be no cutoff time for fishing but all boats MUST have cleared the check-in boat by 5:00 PM to be eligible. Check-in/weigh-in will begin at 2:00 PM. The tournament check-in boat will be positioned on the south side of Port Canaveral near the East end of the no-wake zone. ALL BOATS having fish to weigh-in MUST CHECK-IN with the Canaveral tournament boat, both visibly and audibly. All boats must return under their own power. Boats rendering assistance in emergency situations may be granted a weigh-in extension after making contact with tournament headquarters. All fish to be entered must be brought by water to Sunrise Marina on the vessel they were caught. The fuel dock at Sunrise Marina is the designated drop-off point. No docking allowed. This will be the only point that fish will be accepted for weigh-in. Notification on VHF channel 72 will be given at 4:45 and at 4:55 of the nearing end of the Tournament. An announcement will be made at 5:00 of the Tournament end. The check-in boat will follow the last legal entry to the weigh-in dock. Anglers will off-load their fish to be tagged, fresh tested and then weighed. Tournament registration stub and boat number must be brought to weigh-in together with the tagged fish. All fish are subject to a freshness test using visible indications and if required additional testing. Vessels will be directed by the Dock Master to a holding area until fish are weighed and anglers are able to return to their vessel. A designated crewmember(s) from the vessel must carry fish to the weigh-in scale after they are tagged at the dock and after weigh-in anglers will return to the floating dock next to the sea wall for pick up by their vessel. Only one fish per species, per boat may be entered, with the exception that Women Anglers & Juniors Anglers (16 years of age and younger) may enter one additional fish from any of the General Division eligible species, if so declared at the weigh-in dock. In the situation where the Ladies or junior fish is the heaviest of the species entered by the boat, ONLY that fish is entered in the General Division (and shall also be automatically included in the Ladies / Junior) divisions. In the case the Ladies / Junior fish is not the boat’s heaviest, it may be weighed and entered in the Ladies / Junior Division ONLY. Anglers must designate with Dock Master if the fish was caught by a lady or junior angler to be eligible for additional prizes. If not declared, all fish will be tagged for the General Categories. Anglers are cautioned to make sure their catch is properly iced in order to pass the freshness test. Frozen or frozen-thawed/non-fresh fish will not be accepted for weigh-in. All fish entered in the tournament must be caught on hook and line on the day of the tournament, after 6:00 AM. All tackle must conform to IGFA specifications except that treble hooks may be used (e.g. Kingfish Rigs). Wire line is not allowed. No winding of reels permitted by mate. Rods may not be passed on any fish. No hand lining of fish allowed. Fish ‘damaged’ (for example by prop, shark attack) that in the opinion of the Committee were unable to continue to fight, shall be disqualified. Winners may be subject to Polygraph test. All monies will be withheld until polygraphs deemed necessary are given and results obtained. If you think you’re a contender for a major prize, it’s advisable to remain sober for lie-detector test at weigh-in. Intoxicated anglers will not qualify for lie-detector testing. Protests must be made, in writing, prior to 6:00 PM. Protest must be accompanied by a $150 CASH deposit which will be refunded if protest is upheld. Otherwise, the deposit will be forfeited. All decisions will be made by the tournament committee and are final. The Coast Guard has declared Port Canaveral as a NO-WAKE zone for tournament day. This idle zone will be monitored by the Coast Guard & Florida Fish and Wildlife Service. Vessels violating this mandate will be ticketed and disqualified from the tournament. There will be NO exceptions! Nothing in these tournament rules shall be construed to limit or restrict the authority of the tournament committee to modify, promulgate, add, delete or make other changes to these rules as deemed appropriate at their discretion, without prior notice. Mutilated or non-fresh fish will not be weighed. The decision of the tournament committee in these matters is final and cannot be challenged. An individual fish may be eligible to win both a cash prize and Recognition Award (Ladies & Junior). 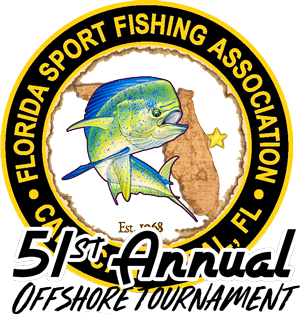 General Award: Eligible Species: Dolphin, Wahoo, Kingfish, Grouper (Gray or Red, No Warsaw). There are $12,000 total in guaranteed payouts for General Awards. Big Fish Award (BONUS): Eligible Species: Dolphin, Wahoo, Kingfish, Grouper (Gray or Red, No Warsaw). There is $5,000 guaranteed payout for the LARGEST (by weight) Fish. The Big Fish will win the big fish bonus and will be included as 1st Place in the General awards. Big Fish will pay First Place of $1250 PLUS $3750 bonus for a total payout of $5000. The Big Fish can be one of the 3 species to be calculated for the Slam. General SLAM: Eligible species Dolphin, Wahoo, Kingfish, Grouper. Greatest weight of 3 fish of 3 different species. There is a $3000 guaranteed payout for the Heaviest Combination Weight of a 3 Species Slam. Ladies: Recognition Awards for 1st, 2nd and 3rd Place. A fish declared and tagged as a Ladies Fish may be entered in General Division – however when doing so it is the ONLY species that is entered by the boat team. That fish is thus eligible to win in both General Cash Prize and Ladies Recognition. Eligible Species: Dolphin, Wahoo, Kingfish, Grouper (Gray or Red, No Warsaw). Junior: Recognition Awards for 1st, 2nd and 3rd Place. A fish declared and tagged as a Junior Fish may be entered in General Division – however when doing so it is the ONLY species that is entered by the boat team. That fish is thus eligible to win in both General Cash Prize and Junior Recognition. Eligible Species: Dolphin, Wahoo, Kingfish, Grouper (Gray or Red, No Warsaw). Bonus Fish: One Entry per boat allowed in either (or both) species. There is $1,250 total in guaranteed payout for the Bonus Species. $625 for heaviest Cobia, $625 for heaviest Amberjack (AJ). GENERAL, BIG FISH GRAND PRIZE: The Big Fish Grand Prize in the amount of $5,000 ($1250 1st plus $3750 bonus) will be awarded to the angler who weighs the heaviest fish. This is a stand-alone category and the winning fish will be eligible for General SLAM inclusion, but no other categories. Both ladies and juniors are eligible for Big Fish Grand Prize. Must be eligible General Division tournament species: Dolphin, Wahoo, Kingfish, Grouper (Grey or Red, No WARSAW). In the event of a tie the winning fish will be the first fish that was weighed at the tournament scale. Fish entered in Big Fish do not have to be declared as such. When ‘knocked out’ of this category the fish automatically is placed in the General Division. General SLAM: Fish will not be declared at weigh in as ‘slam’. Fish must be entered in General Categories (including if a Ladies or Junior is the team entry and thus General entry). Required 3 fish of different species: Eligible Dolphin, Wahoo, Grouper and Kingfish. Weights will be calculated of three heaviest weighed by each team in General Category. Combined weight of 3 fish shall be declared the winner. LADIES: 1st through 3rd: Heaviest weight of any General Division eligible species caught by a lady & tagged at the dock as a ladies fish. Ladies prizes are Recognition Awards. JUNIOR: 1st through 3rd: Heaviest weight of any General Division eligible species caught by a junior & tagged at the dock as a junior fish. Junior awards are Recognition Awards. All Junior’s are encouraged to weigh their catch! Each Junior weighing a fish will receive a raffle ticket for a special gift. BONUS Fish: A cash prize will be awarded for the Heaviest weight Cobia and for the Heaviest Amberjack (AJ). The cash prize for each heaviest fish is $625 Neither Cobia nor AJ qualifies for General Division, Big Fish Grand Prize, General Slam, Ladies or Junior Divisions. The public viewing ‘board’ is for information only and shall not be considered “OFFICIAL RESULTS” until declared so by the Weigh In Committee.